1. How do I order RapidBac™Vet? 2. What is the shelf life of RapidBac™Vet? 3. Does RapidBac™Vet have a subscription service? Yes. If you frequently reorder with us we have a subscription service we can custom tailor to your schedule. Give us a call at 888 438 1942 and we will get you set up. 4. When and why should I use RapidBac™Vet? - Whenever there is the suspicion of an infection. 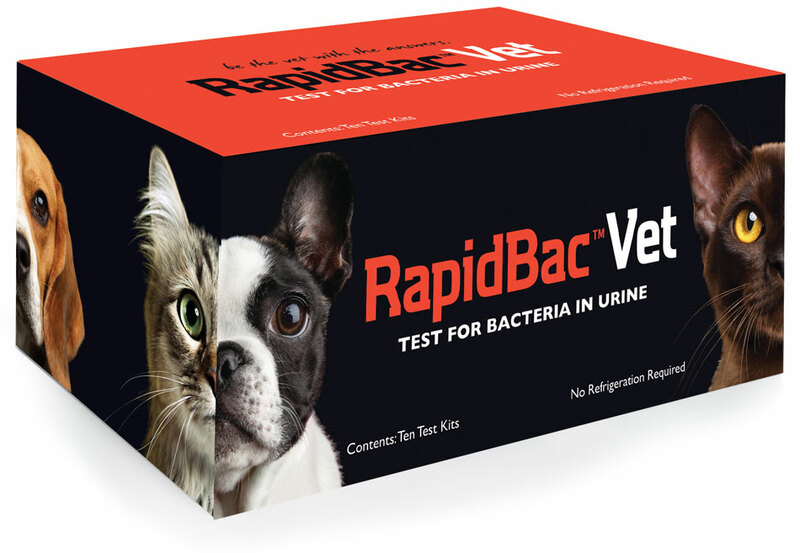 RapidBac™Vet costs $15.00 per test and results correlate with urine culture. Submitting only test-positive urine samples for costly culture and sensitivity in cases of recurrent or complicated bacterial infections reduces unnecessary costs. - Test strip indicators help you choose the appropriate first-line antibiotic by indicating whether the infection is Gram-positive or Gram-negative. - Testing after antibiotic treatment provides assurance that the treatment has resolved the infection. - Diabetic pets are expensive and a big commitment – best practice is they need twice yearly bacteria tests. - Older dogs and cats – best practice is twice yearly bacteria test once they reach 7 years or older – offer this to your clients. - Cushings Disease - Because having Cushings disease is just like being on steroids - and any pet on steroids should to get bi-annual urine cultures since they are predisposed to urinary infection. - Cats with chronic Renal Disease - RapidBac™Vet should be a routine part of the initial workup and staging for cats diagnosed with chronic renal disease (CRD). Make this a compliment to the International Renal Interest Society's (IRIS) staging, in order to facilitate appropriate treatment and monitoring of the patient. - Dogs with bladder stones or bladder tumors - because bladder stones/tumors predispose them to infections. - Cats with idiopathic lower urinary tract disorders. Screening for bacteriuria using RapidBac™Vet should be incorporated in the diagnostic workup of ALL cats presenting with lower urinary tract signs. 5. Does RapidBac™Vet need to be refrigerated? No. The tests can be stored at room temperature. Faint lines are considered valid results, including the control line. A faint line in a positive result may be caused by a low concentration of bacteria or a species of bacteria that expresses low levels of the targeted antigen on its surface. In these cases, bacteriuria is present even though the line is faint. If you have any questions about your result - please call Customer Service at 888 438 1942/(+01) 626 359 8441 and we can troubleshoot the procedure. 7. What is the science behind RapidBac™Vet? RapidBac™Vet is a lateral flow immunoassay that uses monoclonal antibodies that specifically bind to a bacterial cell surface antigen. 8. Do you have a VCA ANTECH vendor number? Yes. RapidBac™Vet's VCA vendor number is 86968. 9. What if I am a member of The Veterinary Cooperative? TVC members will need to look at the RapidBac™Vet detailer page to find out what the promo code is and enter it in the "discount" box at check-out. When ordering via phone, e-mail, or fax, please mention the promo code when placing your order. Order a free sample today and see the benefits for yourself. Or better yet, purchase a box of ten kits and be prepared for the next ten dogs or cats that walk through your front door in need of evaluation. Either way, we’re sure you’ll be 100% satisfied. Free shipping on all opening orders.